Newportant People Historic Edition | On July 4th 2011 at the Old Colony House on Washington Square in Newport Rhode Island several dozen people gathered to be a part of history. Well, turns out there were many histories that were a part of that day. 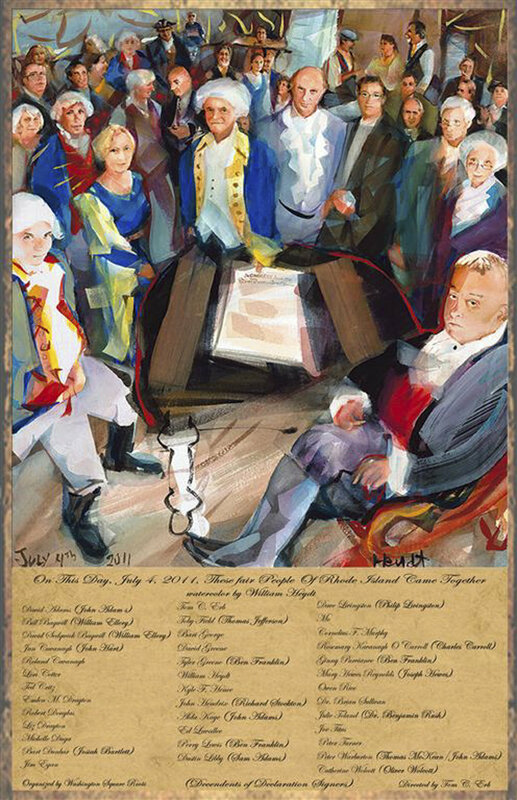 Newport Historical Society and Washington Square Roots sponsored and produced the Bill Heydt re-creation of the famous John Trumbull painting Declaration of Independence depicting the signing of the Declaration of Independence. This painting was actually created in Trumbull’s and Jefferson’s mind. It never really happened. During this time period the people who were debating the declaration changed so often because the debate was long and drawn out. So in truth, all of these men were never in the same room at the same time. Even so, we have burned John Trumbull’s version on our currency and in our minds to portray how it looked the day the declaration was signed. 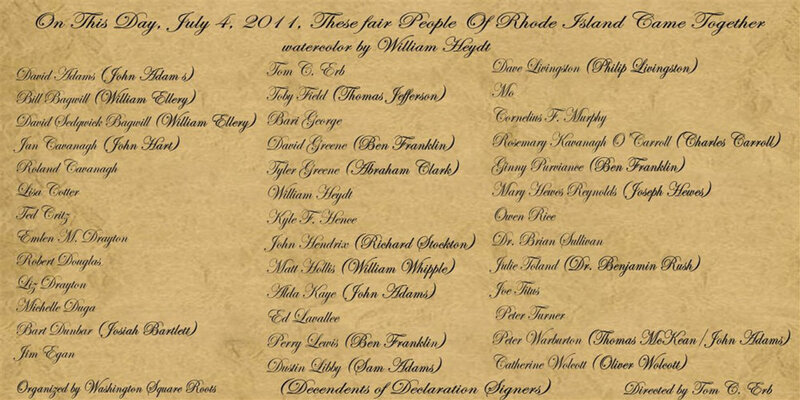 The title of Heydt’s re-creation of Declaration of Independence is “On This Day, July 4, 2011, These People of Rhode Island Came Together”. On that day there were people there who wanted to celebrate the signing, and there were people who wanted to honor their decedents who were actual signers of the Declaration of Independence. But all of them were there because they are proud Americans who wanted to show their love for their country, and to also in some spiritual way reach out and touch the brave men who founded our great nation. The event was conceived and directed by Tom C. Erb of STAGERightRI. “I wanted to take a brief moment and turn back the clock so we would remember where we came from, and to have a snapshot of the local, regional and out of state people who came together to remember their own history that directly created all of our history” Erb Said. Erb and Heydt approached Liz Drayton of the Washington Square Roots and Ruth Taylor at the Newport Historical Society and it came together as part of the Washington Square Celebration on July 4th.